Oh you slutty whore! Plug Whore t-shirt calls the little skank out. Plug Whore! Just look at that skank! Just how many plugs does she need? Well this one is ready for some hot four-way action, that is until Ms. Extension Cord came in to call her out for being such a slutty whore. Funny graphic shirts like this are always a hit. 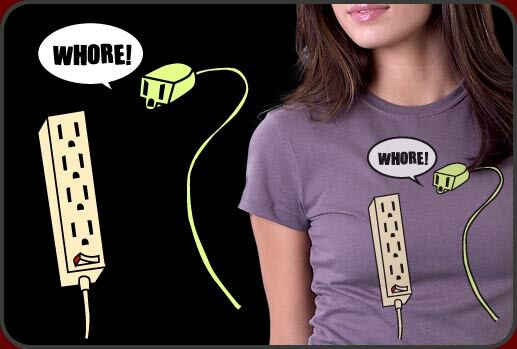 Our plug whore shirt is sure to get friends and family laughing out loud. Plug Whore is available on an amazing array of shirt colors and styles for men, women and children. You can customize just about everything about the shirt too. It's a lot of fun and a great way to make your own shirt using this design. What a crazy funny shirt design with lots of attitude. Plug Whore!